Government is consistent in keeping the environment clean following President Mnangagwa’s launch of the national clean-up exercise. 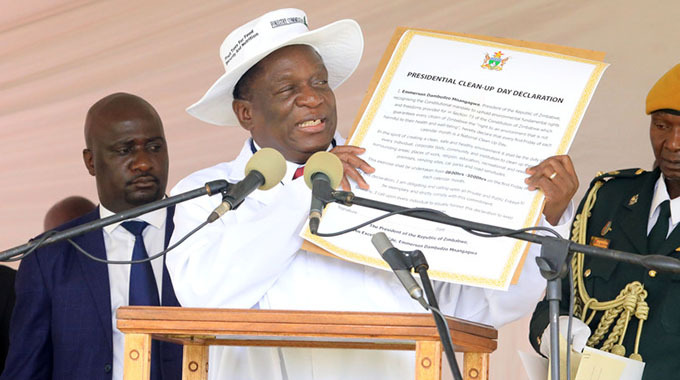 President Mnangagwa declared the first Friday of every month as the national clean-up day. Environmental Management Agency said the next clean-up will be held tomorrow. “The first Friday of February 2019 falls on the first day of the month, all citizens of Zimbabwe are encouraged to come out in their numbers and clean their immediate environs from 0800hours to 1000hours. “Clean the front, back, sanitary lanes and all areas around your premises and beyond, pick up all litter and clear dumps. “On the 5th of December 2018, His Excellency, President E. D. Mnangagwa declared that the first Friday of every month is the national clean-up day. Chapungu also said it is everyone’s responsibility to keep the nation clean. “If we all participate, we will achieve a clean, safe and healthy environment,” she said. Chapungu urged various stakeholders in the clean-up campaign to procure cleaning materials for it to be a success. “Where stakeholders may have challenges or unable to procure their own cleaning materials, the Environmental Management Agency (EMA) can assist,” she added. EMA emphasised that, for sustainability of the program, leadership involvement and participation is key. The inaugural National Clean-Up Exercise was on January 4 this year where various stakeholders including the Presidium, Cabinet and Provincial Ministers, corporates, civil society, religious organisations, politicians and the media fraternity participated in the program, thus making it a success. “Such inclusive participation is commendable as it is a key enabler to attaining Sustainable Development Goal number 11 which is “to make cities and human settlements inclusive, safe, resilient and sustainable. “All waste generators are encouraged to embrace and adopt waste separation at source as it enables waste to be re-used and recycled thus creating green jobs,” said Chapungu.